This is a way of hot smoking salmon that can be done in your own kitchen, but it will look and taste like it came from a restaurant! 1. Using a potato peeler, slice the cucumber into ribbons. Put the slices in a colander, toss them with the salt and let it stand in the sink for about 30 minutes. 2. Meanwhile, combine the sugar, vinegar, water and bay leaf in a medium saucepan and bring to the boil. Remove from the heat and allow to cool. 3. Rinse the salt off the cucumbers and gently squeeze out as much water as possible. Put the cucumbers in a medium bowl and add the pickling solution. They should be completely covered by the brine. Cover and refrigerate for at least 2 hours before serving. The pickled cucumbers will keep in the refrigerator for up to 5 days. 5. Carefully remove the skin from the salmon and set it aside. Rinse the fish and pat it dry thoroughly. Remove any pin bones and place the salmon on a wire cooling rack. turn up and the flesh flakes away easily. Allow to cool to room temperature, then either serve straight away or refrigerate for up to 2 days. 7. 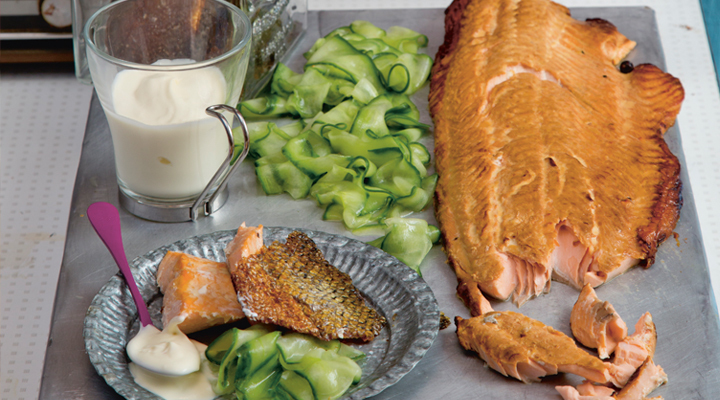 To make the salmon skin crisps, turn the oven down to 180°C/gas mark 4. Rinse the skin well under cold running water and pat it dry. 8. Line a baking sheet with non-stick baking paper. Place the skin on the lined tray, shiny side down. Drizzle a little olive oil on the skin and rub to distribute it evenly. Sprinkle with a pinch of salt. Flip the skin over so that the shiny side is facing upwards. Drizzle with a little more olive oil and rub to distribute it evenly. Place the skin in the oven, shiny side up. Bake for 10 minutes. At this point, check it every 5 minutes until the desired crispiness is reached. Break into large pieces. TIP: You will need 1 large disposable foil tin.